The filmmaking collective Radio Silence cannot explain how they created a movie so frightening and disjointed that it could take the claim as a perfect horror film. They’ve been making short form films for awhile now on YouTube and that’s where producer Brad Miska (of Bloody Disgusting) found them. Because of the collaborative nature of the group, the idea of a director or credits doesn’t matter to them. That approach followed them to v/h/s. v/h/s is an anthology of five films plus a wraparound, which brings it to six. Radio Silence knew from the start they all wanted to tackle the found footage approach in the same wayand wanted to solve the problems that found footage inherently has. How do you do something original these days in that style of film? Found footage is close to jumping the shark, but the Radio Silence crew credit the anthology aspect of the film for the films success. All the filmmakers were really aware of answering ‘the essential five why’s. Why the camera is a character in the film? That question is one of the reasons why some found footage movies fall apart and aren’t plausible.Why are we still rolling? Why are we still seeing this? Why does the audience have a portal into this world? Why does it continue even after when things go crazy? They had genuine scares when seeing the film for the first time when it screened at Sundance, mainly because they hadn’t seen the completed film and it was screening at SUNDANCE! They had no clue what the experience and the response was going to be. None of them were making the film for a Sundance audience. 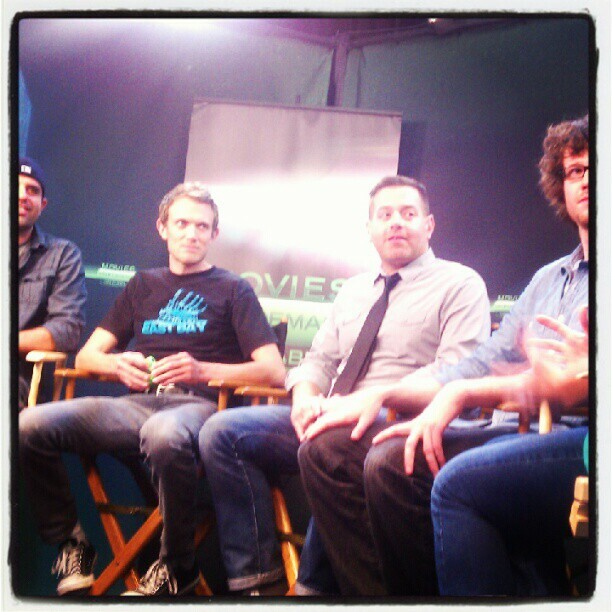 Producer Brad Miska (of Bloody Disgusting) got credit from the Radio Silence filmmakers for how it all came together. The filmmakers knew they were doing the anthology aspect via found footage, but none of them knew what everyone else was doing. The wraparound was shot first, so at least they knew where it was headed. It’s a unique quartet of a group. Justin Martinez, Matt Bettinelli-Olsen, Chad Villella, Tyler Gillett. In a certain way they speak of themselves like a band. The idea is they surround themselves with ‘those that do.’ They make sure to keep an open, honest critique with each other and have built it into a working relationship where they can present ideas and no one particular process of the filmmaking moves forward until they are all on the same page. With found footage a lot of the time dialogue is improvised. The band had story beats set for the scenes and were kind of choreographing the editingin camera. These guys didn’t really see themselves doing anything different with the feature than they had already been doing with their shorts on YouTube. It paid off to their benefit. They also always felt like what they were doing for online could play in theaters, so making the transition was easy for them. Next up for Radio Silence is Laserdisc followed by 8-Track, which just might conclude the trilogy of anthology films titled after obsolete formats.